Kim Taylor is something of an acclaimed nature photographer. 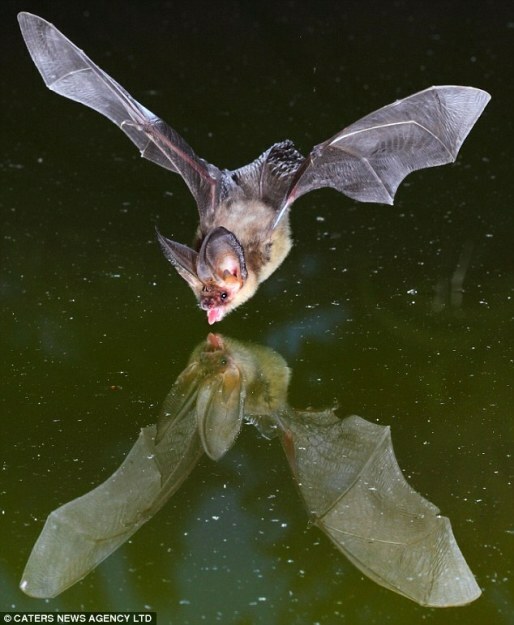 However, for these incredible images of bats drinking from a pond, he didn’t have to go anywhere fancy. Nope, Kim captured these night-time visitors in his own backyard, using a high speed photography set-up of his own design. That’s not saying that Kim didn’t have to work for his shots. Not only did he have to place the camera and flash equipment, but he also had to rig up a squeak-detecting sound sensor, a series of ropes and planks to get the bats to drink from the right spot, and infrared sensors to capture the motion of the bats as they approached the camera. Not only that, he also required 3,500 volts of electricity to generate the powerful flash necessary to capture a hand-sized bat streaking across the surface of the pond at 20 miles an hour. Obviously, what Kim did isn’t for the novice photographer, but you can definitely capture some cool images of nature in your own backyard. For instance, I’ve got more pictures of rabbits cavorting in my backyard than you could imagine, thanks to the warren they’ve built under the shed. I’ve spotted other critters in my neighborhood (including a few red foxes), but I’ve never captured them on film. Maybe I need to build a super camera trap like Kim’s!